ACI says its Personnel-Cleaning Booth provides a safe and effective means of removing and collecting dust/fibres from people and clothing. It is suitable for cleaning employees’ dirty work clothes to avoid exposing them, their co-workers, or their work environment to elevated dust levels. Workers, without taking off clothing/PPE equipment, can remove most visible traces of any dust/fibre from themselves and clothing within about 20 seconds. 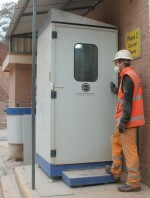 The booth is a self-contained, free-standing unit incorporating the company’s blower-powered JetBlack personnel de-dusting system. The JetBlack delivers a high volume of filtered air at low pressure, sufficient to remove dust and fibres effectively and safely, even when directed at exposed skin. In operation, the integrated JetBlack is used by Booth occupants to dislodge all dust and fibres which are then drawn down away from personnel.